With ultramodern facilities of advanced technology and productive work of our team of skilled professionals, we have manufactured and exported specifically made assembly workstation. Ergonomic design of assembly work station makes it comfortable and adjustable. It is provided with bench top. We offer various top options according to the applications. Our assembly workstation contains overhead tube light and perforation panel. The tool holder hooks on the assembly workstation keep all tools with systematic manner. Organized inventories of tools and kits add value to the proper functioning. It is smartly fabricated to provide excellent working condition with perfect height and appropriate arrangement of required parts and tools. It is provided with exact size of drawer with partition and divider to keep the inventories of tools and kits. 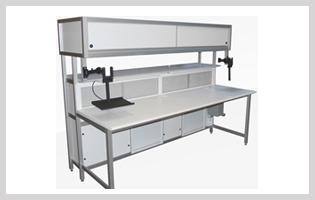 We can customize assembly workstation as per requirement and specification.